Thank you for this optimisation. I will test it this evening. I would have some question about using this algorithm. * How fast should I read the sensor and make the DCM update? * Should I do this using interrupt based code? * How to choose the "right" parameters for the filter? the frequency at which You need to read the sensors and perform the orientation estimates depends on Your application. I read a MARG sensor cluster at 200Hz which seems to be enough for my MAV prototype (40cm-class quadrotor). The decision whether to use interrupt-based code depends also on Your application. If the main task of the controller is running the orientation filter, then a synchronous reading via I2C with delay loops might be sufficient. If You want to perform multiple other computations in "parallel", an interrupt-based code might be preferred. Choosing the "right" parameters for the filter depends on the noise and biases of your sensor readings. It can be figured out experimentally. Here is the capture of my raw sensors as well as the output of the filter. Have you a range of correct settings for beta? Is it required to calibrate the sensors? How this is done? the most important thing to do ist to identify the bias of your gyroscope. You can do this by keeping the device static, then sample N gyro measurements, compute the average and subtract this average (aka bias) from each gyro reading. So you need two states: the initialization state in which you identify the biases and the operational state in which you substract the bias from each new reading. When using the madgwick filter you should also go sure that you convert the gyro values to rad/s (not deg/s) before feeding them into the filter. I think the latter is the problem which leads to overshooting when reducing the beta gain. Thank you for your answer. It helps me a lot !! I just noticed that the values from my gyro were in deg/sec instead of rad/sec !! I will try this correction this evening and see how it reacts. But correct me if I am wrong, normally the gyro bias has to be fixed by the complementary filter? Otherwise, it might be difficult to have it calibrated each time (for an end user). I will test with and without calibration to see how it is handled. Yes, the gyro bias is corrected by the feedback step of the complementary filter but you will achieve better results when the bias is known a priori. Hi, 0.3g should not be a problem. We have acceleration around +-3g on our UAV; we have beta set to 0.025 and no error builds up. Is everying alright with your sensor data? The static error on accelerometer is +-0.02g, on gyro is +-0.4deg/s, on magetometer is +-0.01guass. My sampling rate is around 160HZ. Maybe it's too low? I checked Madgwick's paper and it looks like there is no big difference once the sampling rate is above 100HZ. 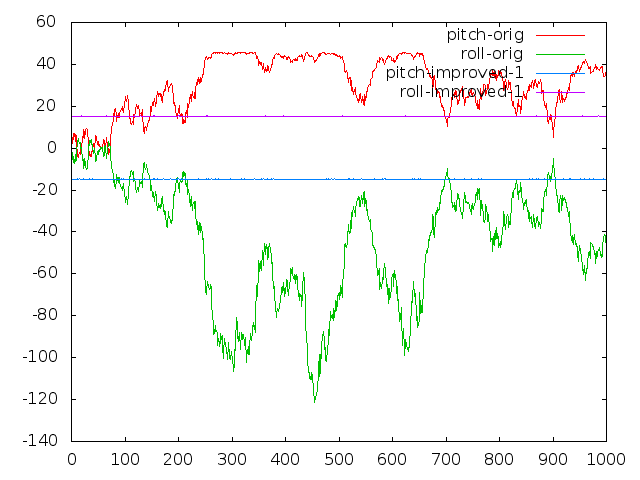 When I just lay everything flat on the table and slide it continuously in all directions, the pitch and roll errors build up but converge to 0 slowly(in 3sec) once I stop sliding. The sampling rate should be no problem. What is your set-up? Are you using a 32 bit or a 64 bit processor? Which kind of sensors are you using? Is the axis alignment correct? Did you calibrate the gyro upon start-up? I'm playing with a board that has an mpu60X0 and shoehorned the Madgwick algorithm onto it with a lot of trial and error. You guys are talking about overshoot and I have undershoot/lag. I increased the integration time and it almost looks right. It takes a lot of memory to run it too. All my playing and I haven't found anything that improves on the DIYdrones DCM.